Want to enjoy your 2D movies like a 3D one? This article will recommend you a great video conversion tool to convert any downloaded or homemade 2D movies to 3D MP4. You can enjoy the 3D MP4 movies at home but like in a cinema and get a vivid, and real visual entertainment. The recommended tool has superb fast conversion speed, loss-less output quality and is very easy to use. Just get it below. 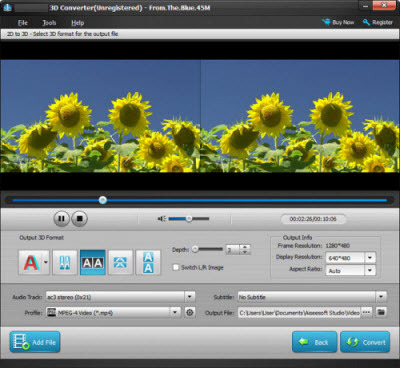 • Convert videos in any format to 3D including 3D MP4, 3D MKV, 3D WMV, 3D AVI, and more. • Burn almost all the videos to DVD disk to enjoy on a bigger screen. • Edit videos with the great video editing functions like trimming, cropping, adding subtitle, etc. • Optimized presets for converting video directly to devices like iPhone, iPad, and Android phones. • Download videos from many video sharing sites, YouTube, Facebook, Dailymotion, etc. Get below to see how to convert 2D to 3D MP4 in Windows (Windows 8.1/8/7 included). Launch the UFUWare 3D Video Converter, select “2D to 3D” mode, then you can select “Add Files” under the main interface which enables you to import all 2D video files in your chosen folder into the 2D to 3D MP4 Converter for converting. To get your own overwhelming 3D experience, you here need to go to “3D Settings” to set output 3D video effect. There are four 3D setting modes provided: Anaglyph, Side by Side, Side by Side (half-width), Top and Bottom, or Top and Bottom (half-height). And the choose output format MP4 in “Profile”. Click “Convert” and let the UFUWare 3d Video Converter accomplish the rest automatically. Now, equip your 3D glasses and import these converted 3D MP4 files into your player and start your theatric 3D experience at home! BTW, you can also upload these files to your YouTube 3D page for sharing.